A rare .177 calibre lever-cocking air pistol, Lincoln Jefferies Type B model number 43 being offered in the Sporting and Collectors Auction on 12th August 2015. While the Sporting and Collectors auctions may not have the traditional glamourous areas of pictures, ceramics and silver, they have always been appealing for the quirky and unusual items that dealers and collectors are equally passionate about. Perhaps in contrast to some of my colleagues, I am keener to search through old barns, sheds and garages for these hidden gems when on an appointment. Having a natural curiosity for trying to work out how things work and what they were used for often comes in handy, as was the case with a recent consignment from North Devon, which revealed a rare item. Laying in the bottom of a box was what at first appeared to be a type of grease gun, but in actual fact was a very early model of a Lincoln Jefferies .177 air pistol. Most people will be familiar with the later Webley Junior models (even if only for Tom Good's marksmanship in an episode of 'The Good Life') but there are a few very early short production run models that are desirable to collectors. Air guns are the perhaps earliest form of pneumatic technology and were first developed at the end of the 16th century. Their development progressed rapidly as they had the distinct advantage of being able to fire in damp conditions, unlike their early powder counterparts and they were silent which was advantageous in not revealing the shooter's location. Towards the end of the 19th century, the popularity of target shooting in England, and in particular in Birmingham, was such that teams competed in pubs, even shooting in regular competitions over the heads of the crowds. There were around 4,000 air rifle and target shooting clubs in this period, which was a market many manufacturers were keen to develop. This pistol is a variation of an early 1905 Type B Lincoln, with the cocking lever to the rear of the cylindrical reservoir that also forms the grip. 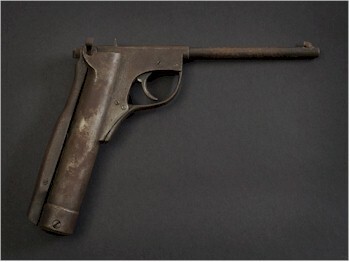 Later models form 1921 onwards have the cocking lever to the front, which also doubles as the trigger guard and fetch between £400-£500 at auction. This earlier model could quite easily fetch four figures from dedicated collectors. While I am sure many of you may prefer a nice diamond ring or piece of Worcester porcelain, it is worth bearing in mind that when I rang the client to tell them about this rare find, it certainly made their day - as they themselves said: "I wasn’t going to bother putting that old thing in..."
This rare .177 calibre lever-cocking air pistol, Lincoln Jefferies Type B model number 43 to be offered in the Sporting and Collectors Auction on 12th August 2015 .